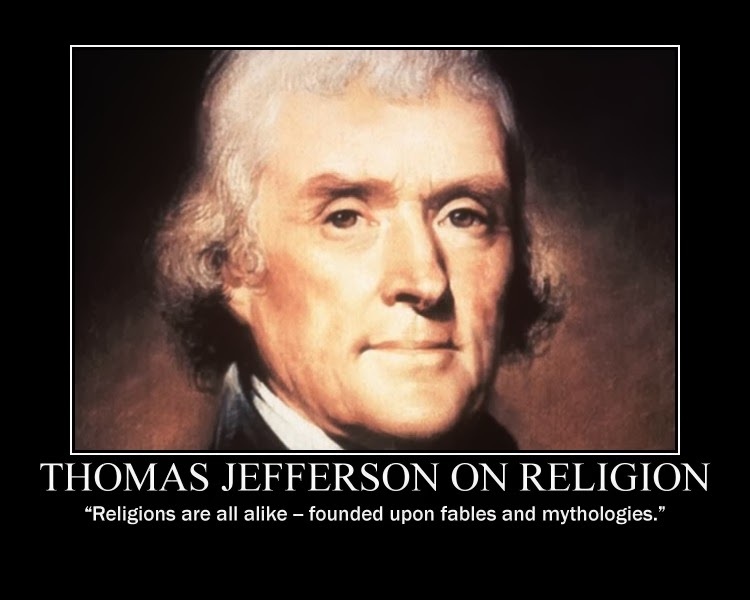 The majority of our postings are useful for debating Sheeplets online, and today's post by Michael Hayne at Addictininfo.org, "Top Ten Thomas Jefferson Quotes On Religious Freedom," is no exception. "Today is Independence Day, a day in which we reflect on the bravery of Will Smith and Randy Quaid, engage in sodium nitrate vertical distribution, and blow off major appendages. Freedom in America is and has been under assault for quite some time by right-wing ideologues. Sadly, the conversation regarding the flagrant erosion of individual freedoms has been hijacked by a million moron army of stupid white people on Rascals and a penchant for wearing teabags. "The biggest and most salient of freedom encroachment would have to be in the arena of religion. Not to make Sean Hannity cry, but our nation was founded not by Christians (Sorry, Fox News) but rather Deists. These were great men and products of The Enlightenment, thus men who did not believe the bible was true and therefore relied on reason over faith. These deep thinkers and skeptics believed the universe had a creator, but that providence does and should not concern himself with the daily lives of humans, and does not directly communicate with humans, either by revelation or by sacred books. They did not deny the existence of Jesus but they did not accept him as divine. Chief among them was Thomas Jefferson. 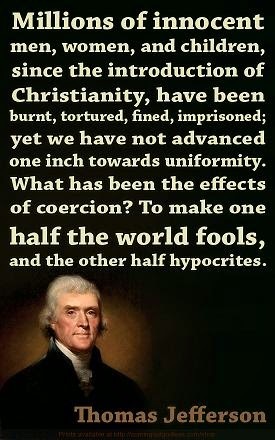 "Okay, so Thomas Jefferson was too slave happy and rubbed knickers way too much with them, but that is but one blemish on an otherwise outstanding history of ardently advocating for religious liberty and secular thought. After all, it was Thomas Jefferson who invented the notion of a church and state divide and argued for a 'wall of separation' quite vigorously in his letter to The Danbury Baptists. Flash forward 200 plus years later and America is looking more in the image of Saladin or Tomás de Torquemada (Google them), with its focus on combining fundamentalist Christianity with militarism. 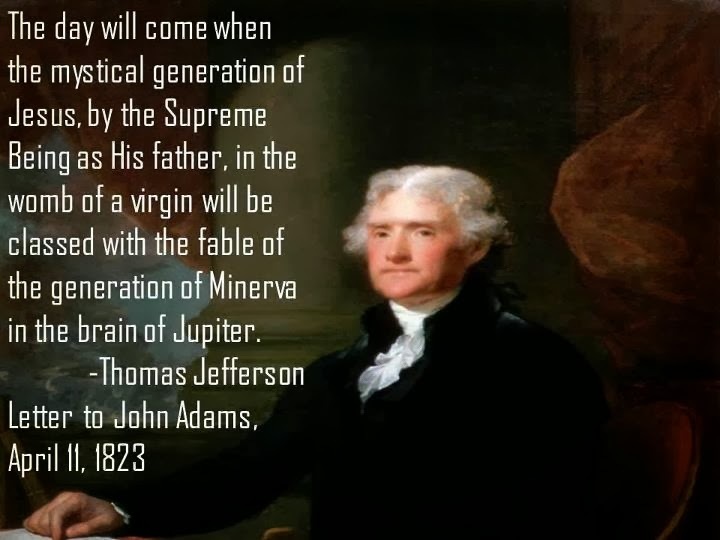 Further, today’s Republican politicians are taking their cues from false prophets and phenomenally uninformed and hateful charlatans such as Pat Robertson, Bryan Fischer, and Tony Perkins as opposed to following the will and LAW of Thomas Jefferson. 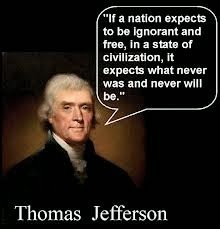 Indeed, Thomas Jefferson is probably rolling over on his slaves right about now. "1. 'Among the most inestimable of our blessings is that … of liberty to worship our Creator in the way we think most agreeable to His will; a liberty deemed in other countries incompatible with good government and yet proved by our experience to be its best support. 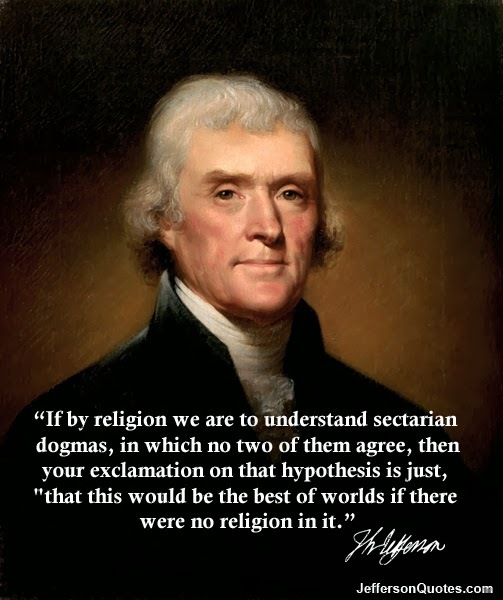 '– Thomas Jefferson, Reply to Baptist Address, 1807. "2. 'The rights [to religious freedom] are of the natural rights of mankind, and … if any act shall be … passed to repeal [an act granting those rights] or to narrow its operation, such act will be an infringement of natural right.' – Thomas Jefferson, Statute for Religious Freedom, 1779. Papers, 2:546. "3. 'The legitimate powers of government extend to such acts only as are injurious to others. But it does me no injury for my neighbor to say there are twenty gods, or no god. It neither picks my pocket nor breaks my leg.' – Thomas Jefferson, Notes on the State of Virginia, 1781-82. "4. 'Subject opinion to coercion: whom will you make your inquisitors? Fallible men; men governed by bad passions, by private as well as public reasons. And why subject it to coercion? To produce uniformity. But is uniformity of opinion desirable? No more than of face and stature. '– Thomas Jefferson, Notes on Virginia, 1782. "5. ' Millions of innocent men, women, and children, since the introduction of Christianity, have been burnt, tortured, fined, and imprisoned; yet we have not advanced one inch toward uniformity. What has been the effect of coercion? To make one-half the world fools and the other half hypocrites. To support roguery and error all over the earth.' –Thomas Jefferson, Notes on the State of Virginia, 1781-82. "6. 'I know it will give great offense to the clergy, but the advocate of religious freedom is to expect neither peace nor forgiveness from them. '– Thomas Jefferson, to Levi Lincoln, 1802. ME 10:305. "7. 'I am really mortified to be told that, in the United States of America, a fact like this [that a bookseller is prosecuted for selling books advocating what was then presumed by the statusuo to be pseudoscience] can become a subject of inquiry, and of criminal inquiry too, as an offence against religion; that a question about the sale of a book can be carried before the civil magistrate. Is this then our freedom of religion? and are we to have a censor whose imprimatur shall say what books may be sold, and what we may buy? And who is thus to dogmatize religious opinions for our citizens? Whose foot is to be the measure to which ours are all to be cut or stretched? Is a priest to be our inquisitor, or shall a layman, simple as ourselves, set up his reason as the rule for what we are to read, and what we must believe? It is an insult to our citizens to question whether they are rational beings or not, and blasphemy against religion to suppose it cannot stand the test of truth and reason. If M de Becourt’s book be false in its facts, disprove them; if false in its reasoning, refute it. But, for God’s sake, let us freely hear both sides, if we choose…. '–Thomas Jefferson, letter to N G Dufief, Philadelphia bookseller (1814), after being prosecuted for selling de Becourt’s book, Sur la Création du Monde, un Systême d’Organisation Primitive, which Jefferson himself had purchased (check Positive Atheism’s Historical library for a copy of the entire letter). "8. 'I am for freedom of religion, & against all maneuvers to bring about a legal ascendancy of one sect over another.' – Thomas Jefferson, letter to Elbridge Gerry, 1799 (see Positive Atheism’s Historical section). "9. 'I never will, by any word or act, bow to the shrine of intolerance, or admit a right of inquiry into the religious opinions of others. '– Thomas Jefferson, letter to Edward Dowse, April 19, 1803. "10. 'Because religious belief, or non-belief, is such an important part of every person’s life, freedom of religion affects every individual. Religious institutions that use government power in support of themselves and force their views on persons of other faiths, or of no faith, undermine all our civil rights. Moreover, state support of an established religion tends to make the clergy unresponsive to their own people, and leads to corruption within religion itself. Erecting the 'wall of separation between church and state,' therefore, is absolutely essential in a free society.' -- Thomas Jefferson, to the Virginia Baptists (1808) ME 16:320. This is his second kown use of the term 'wall of separation,' here quoting his own use in the Danbury Baptist letter. This wording of the original was several times upheld by the Supreme Court as an accurate description of the Establishment Clause: Reynolds (98 US at 164, 1879); Everson (330 US at 59, 1947); McCollum (333 US at 232, 1948). 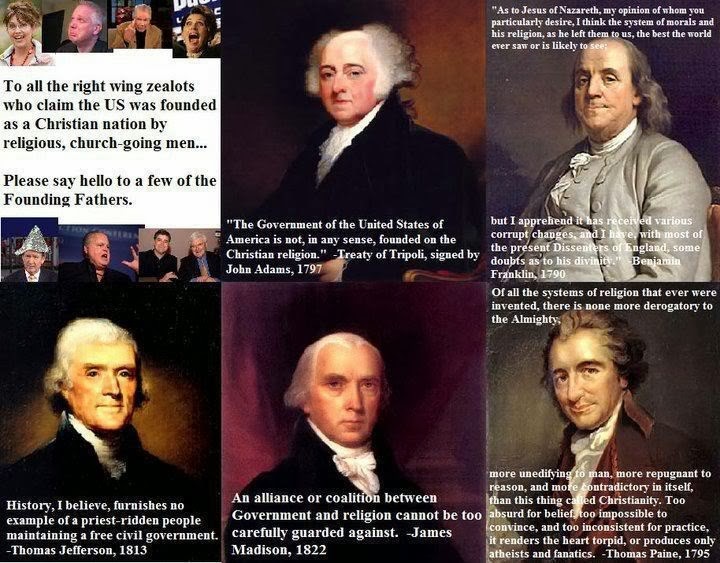 Conservative leaders and their propagandists like to pretend that Jefferson one of them, which should have Jefferson "rolling over on his slaves right about now," but if he turns over each time "...false prophets and phenomenally uninformed and hateful charlatans such as Pat Robertson, Bryan Fischer, and Tony Perkins as opposed to following the will and LAW of Thomas Jefferson" appear to take more money from the Sheeplets, his name in heaven is probably "Pinwheel Jefferson," to make use of an old saw. 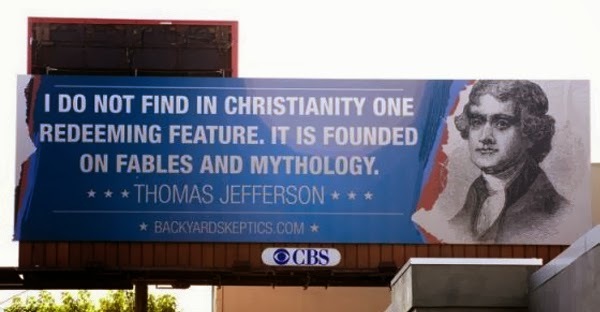 For anyone who has actually read about Jefferson, or has read his writings, knows that he was a Deist, not a Christian who believed in miracles or other superstitions. Deism, according to Wikepedia's entry, is "...the belief that reason and observation of the natural world are sufficient to determine the existence of a Creator, accompanied with the rejection of revelation and authority as a source of religious knowledge..." and Jefferson was probably the most intelligent President in America's history. Our favorite quote is the last one: "Because religious belief, or non-belief, is such an important part of every person’s life, freedom of religion affects every individual. Religious institutions that use government power in support of themselves and force their views on persons of other faiths, or of no faith, undermine all our civil rights. Moreover, state support of an established religion tends to make the clergy unresponsive to their own people, and leads to corruption within religion itself. Erecting the 'wall of separation between church and state,' therefore, is absolutely essential in a free society," and those Conservatives who ignore it for their own hypocritical purposes is 1.) anti-American, and 2.) by extension, a criminal of the worst stripe- one who deliberately distorts the principles that this country was based on. In the hands of stooges like Goebbels and Limbaugh, lies inherent in propaganda spread like wildfire and Conservative lies are willingly swallowed by the Low Information Voter as well as the Conservative Sheeplet who wants to believe those lies. 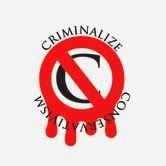 It's time to criminalize "Those who fear and distrust the people, and wish to draw all powers from them into the hands of the higher classes," time to finally get rid of those who seek to destroy the country and its institutions. military age. Then you’re just what they’re looking for."